Photo courtesy of Holly Gardner. Bill McGinn serves a delicious, healthy salmon dinner prepared in his “Salmon Perfection” class at Somethin’s Cookin’. The American Heart Association recommends eating at least two servings of fish weekly, including salmon. Famous for its omega-3 fatty acids, which have been found to decrease several factors for heart disease, salmon also happens to be readily available and versatile to prepare. The wild variety is lower in fat but more expensive than farmed salmon. Wild salmon is available fresh late spring through early fall, whereas farmed salmon can be purchased year-round. Whatever variety, salmon can be pan-roasted, broiled, roasted, grilled, poached, cooked en papillote, canned or cured. It can be chopped up in salad or tossed into an omelet. Bill McGinn recommends the confit preparation — slow-cooking salmon (or another protein) in a low-temperature bath of liquid. This is the technique that students learned at “Salmon Perfection,” a class McGinn taught at Somethin’s Cookin’, a cafe and gourmet grocery store in Panama City. On a handful of dates each month, between six and eight students gather in the cafe’s kitchen for cooking classes, some taught by professional chefs like Tim Creehan and others by home cooks like McGinn. “With poaching, you get the liquid to a light simmer, but here, the temperature never goes above 135 degrees,” McGinn said. When salmon is prepared confit, the result is flaky, fall-apart, melt-in your mouth fish. Confit (pronounced “kon-FEE”) comes from confire, the French verb “to preserve,” and can refer to any kind of slow-cooked, preserved food. Duck confit, a specialty of France’s Gascony region, is perhaps the best-known dish. For salmon confit, McGinn recommends a select cut of fish, which is uniformly thicker. That cut is typically more expensive, but because this particular recipe involves many other flavors in the rice and salsa, McGinn said that the less expensive farmed variety works just fine. Another tip: Buy less expensive olive oil, since salmon confit requires submerging the fish completely in oil to cook it. 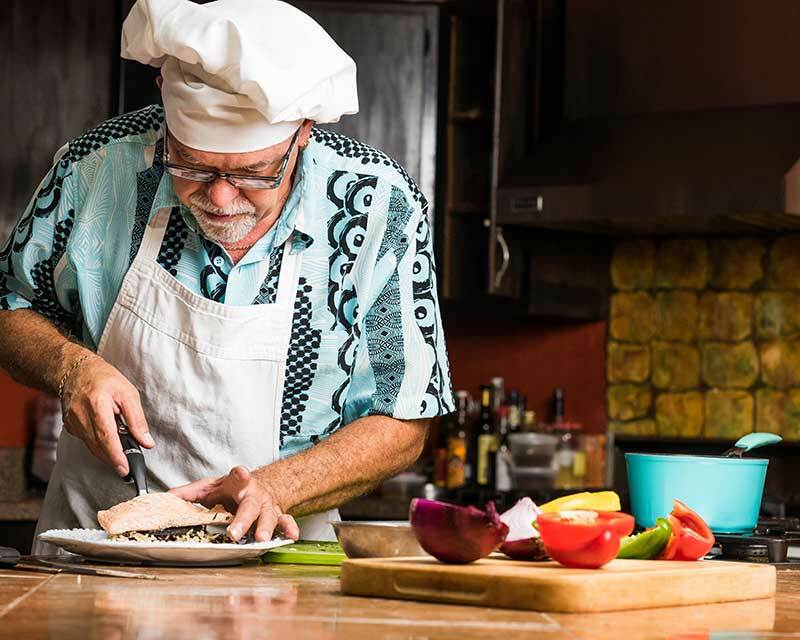 Though the dish he presented at Somethin’s Cookin’ looked fit for a special occasion, McGinn said that it’s actually a great everyday dinner and can be prepared in about a half hour. “When you’re preparing your side dishes, know that the fish will take no more than 15 minutes to cook,” he said. Another benefit of salmon confit: The low temperature means it’s hard to overcook the filets. McGinn recommended a buttery Chardonnay or a Sauvignon Blanc to go with the meal. “My go-to would be a Sauvignon Blanc, preferably from New Zealand, because the citrusy finish really makes the dish pop,” he said. *To add heat, substitute or add any portion of peppers with jalapeños. Begin by cooking the rice according to package directions. Meanwhile, chop vegetables for the salsa and combine gently. Pour enough olive oil to completely submerge the filets into a bowl; stir in garlic, thyme and broken-up bay leaf. Pour the oil into the pan and turn the stove burner to its lowest setting. Using an oil or candy thermometer, let the oil reach a temperature of 125 degrees. Liberally salt the salmon, then place the filets in the pan, constantly monitoring the oil temperature to ensure it stays between 125 and 135 degrees (remove the pan from the burner if it reaches a higher temperature). In 15 minutes at the sustained temperature, your fish should be ready. Use a spatula and a set of tongs to gently remove the fish from the pan, and place it on a bed of paper towels to soak up any extra oil. Combine cooked rice with other ingredients and plate ¼ rice mixture on each plate; place a salmon filet on top of each plate of rice, and top with a generous portion of the salsa. Garnish the dish with pineapple slices.